The What: FSR has partnered with Connectrac, manufacturer of Wireways. Wireways is a floor-based series of cable management solutions for bringing power, data, and communications from the wall to all interior commercial applications. The newly branded partnership, FSR+Connectrac, will allow FSR to extend its product line and offer customers the ability to run cabling across the floor in an organized fashion, while the wiring remains unseen. 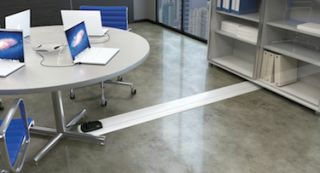 FSR+Connectrac offers users in the professional AV market two options: In-Carpet Wireway, which furnishes discreet power and technology connectivity in open interior spaces of all kinds, and the On-Floor Wireway, which installs directly on top of any type of flooring. The In-Carpet Wireway combines an extruded aluminum central wireway flanked by low sloping floor transition ramps, creating a subtle, powerful, and beautiful cable pathway solution for virtually any need. Extremely durable and flexible, the FSR+ Connectrac In-Carpet Wireway offers a multitude of power options and telecom capabilities. FSR+ Connectrac is ideal for open space connectivity. The FSR+Connectrac On-Floor Wireway system installs directly on top of any type of flooring. Also durable and low-profile, it offers an array of power/AV/telecom connectivity options. The FSR+Connectrac On-Floor Wireway leads the industry in both ease of installation and capacity for telecom/AV cables. In-Carpet and On-Floor Wireway are the best solutions when aesthetics, speed of installation, flexibility and value are critical. The Bottom Line: For use in conference rooms, workstations, training rooms and classrooms, both Wireway options offer a low-profile extruded aluminum wireway, a cable pathway with no core drilling or trenching, a multitude of power and telecom/AV options, pre-wired power components for speedy installation, removable wireway top cap for ease of changing cables, multiple finishes, and ADA compliance. In-Carpet Wireway offers moisture-resistant MDF floor transition ramps; On-Floor Wireway installs directly on top of any type of flooring and is ideal for low-traffic areas.